The clear waters of the Shimanto River flow right in front of Torataro Yoshimura's birthplace. The Ippon-bashi is built over the Shimanto River. It's a very simple structure, just a log that's laid over pilings , but it can float when the river's water level is high, which prevents the bridge from acting as a dam and creating floods. It's not wise to try to fight the violence of nature. 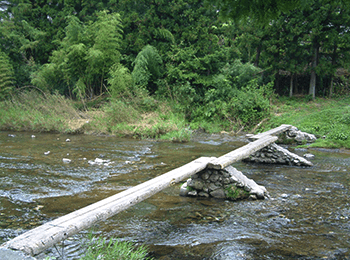 It is said that such ippon-bashi are the prototype for the sunken bridges seen in the Shimanto River. 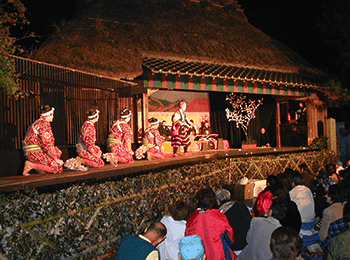 The Ancient Tsunoyama Kagura dance traditionally tells Tsuno town that fall has come. At shrines in Tsuno town, The Ancient Tsunoyama Kagura Dance is dedicated to pray for disease-free and bountiful grain in November. The origin of the Kagura dance is old. It was given to this place when ancient local lord Tsuno came, and ever since it has been handed down by local people, unbroken through the generations. It takes 8 hours to perform all the sections. 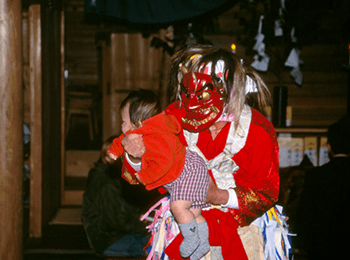 The scene of Gods and people having a good time together has become a symbol of home for the local people in Tsunoyama. The Tsunoyama path is one of the ancient paths connecting Tosa and Iyo, and lots of people, culture and goods ran along this small 1 meter wide path. After Toratato Yoshimura and his sworn friend Gizo Miyaji left the Tosa clan in 1862, many patriots headed from Tosa to Choshu on this same path. Ryoma Sakamoto is one of them. You can relive Japan's past as you head west along this way. 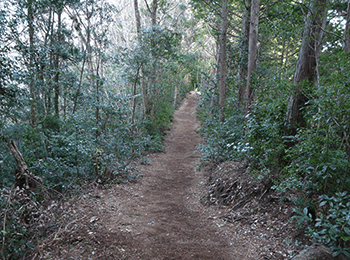 Many old paths called Furuokan are still around Torataro's birthplace and many other places. The remaining trail markers and stone Buddhas who protect passing travellers give a quaint taste of that time. A graveyard where patriots of the late Edo period are buried with Torataro. 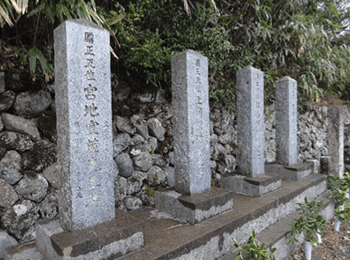 The gravestones for Shinzo Matsuyama and Tanji Kamioka, who played important roles in the Chuyutai of Choshu, and Gizo Miyaji, Torataro's close friend and guardian of Sanetomi Sanjo are lined up next toTorataro's gravestone. They were all from the same neighborhood and became close friends through friendly competition. These four fell in the midst of their dream and could not see the new Meiji era world, but their will was carried on by many later patriots. Takano's Revolving Stage. Plays about Torataro are performed. The revolving stage in Takano, Tsuno town has a structure that allows it to change scenes by turning the center part of the stage with a handle. It was designated as a National Tangible Folk/Cultural Asset as it's one of the few existing revolving stages. You may be able to see Farmer's Kabuki, which is performed on this stage by local people once every four years. Torataro has also been dramatized. It's mass entertainment from the ancient times and is popular with many people.